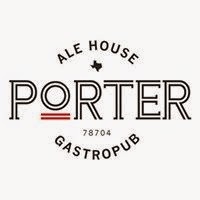 I've been wanting to check out Porter Ale House since its opening in January. They are located on the ground-level of a new apartment building on South First Street, about a quarter mile north of Ben White/Hwy 290, and on site parking is available. The people who I know who have been to Porter have all reported very good things, and can now say, I concur with their findings! Friends and I met for happy hour (Sunday - Thursday, 5 - 7 pm) on a recent Tuesday, and they offer drink specials and a few small plates at reduced prices. 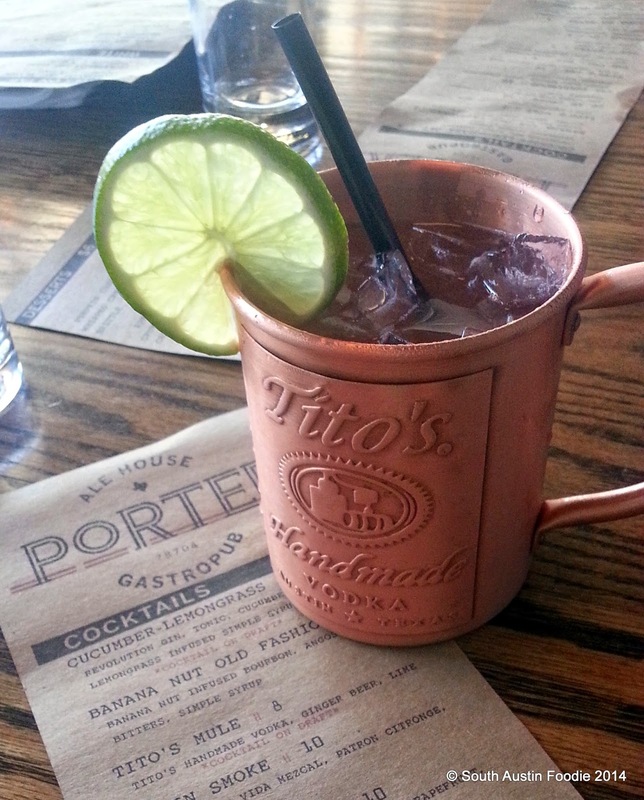 I started with a Tito's Mule in the requisite copper mug, that was refreshing, but not real strong. Truffle popcorn and fries were next. 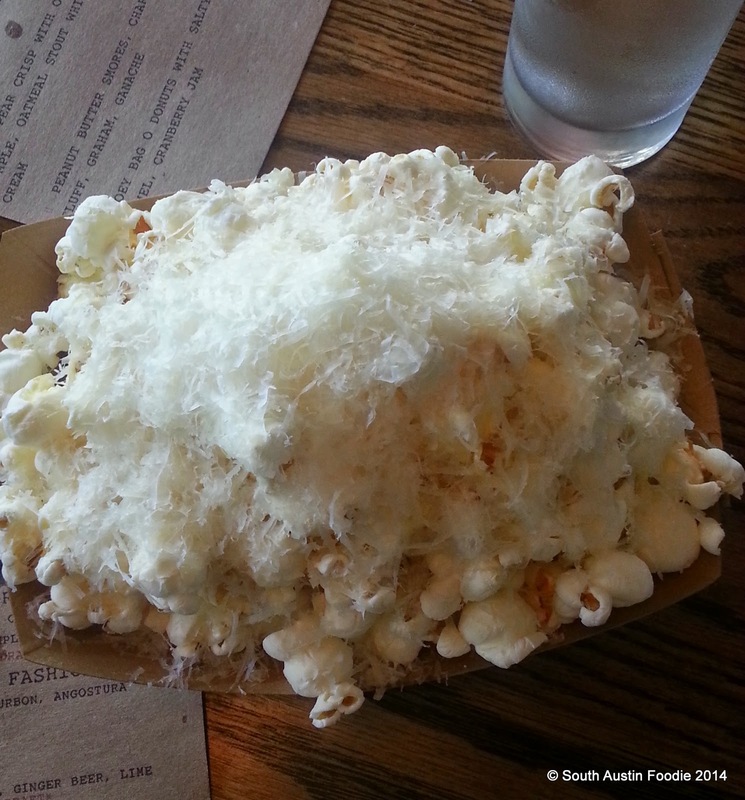 The popcorn has a very nice amount of finely shredded cheese; the ketchup with the fries was a bit sweet and sort of so-so. The country pate plate comes with pickled red onions, gherkins (cornichons), and some toasted breads; good pate, but I think I do like smooth pate a bit better. There was also the grilled flat bread with olives and hummus; I just tried a piece of the bread, and it was fantastic! It's got just a bit of yeast in it, so it's soft on the inside, but lightly charred on the outside. A whole boat of that would have been dangerous. 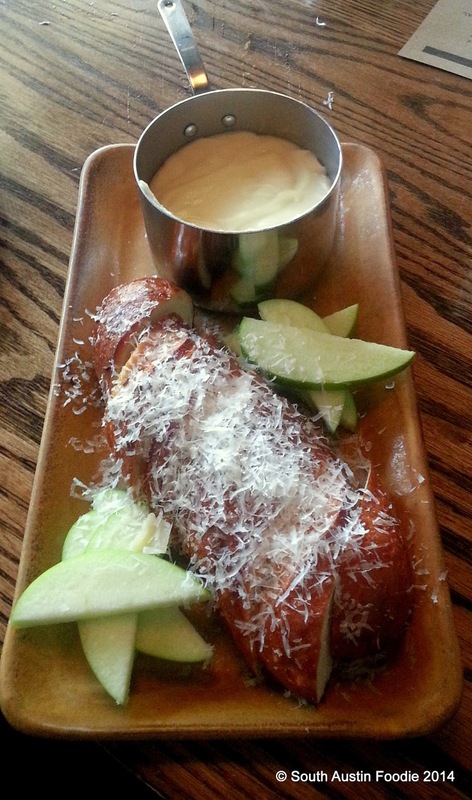 Same with the pretzel bread that was with the beer cheese fondue; don't know if they're making their own breads or if they're getting them from someplace like Easy Tiger, but they are good. And they asked if we wanted more bread and apples (I'd guess Granny Smith) a few minutes after we received the cheesy goodness. I did notice that all of the items we got from the happy hour menu (popcorn, fries, flat bread + olives) were served in paper boats, and the other dishes on wooden planks or trays. 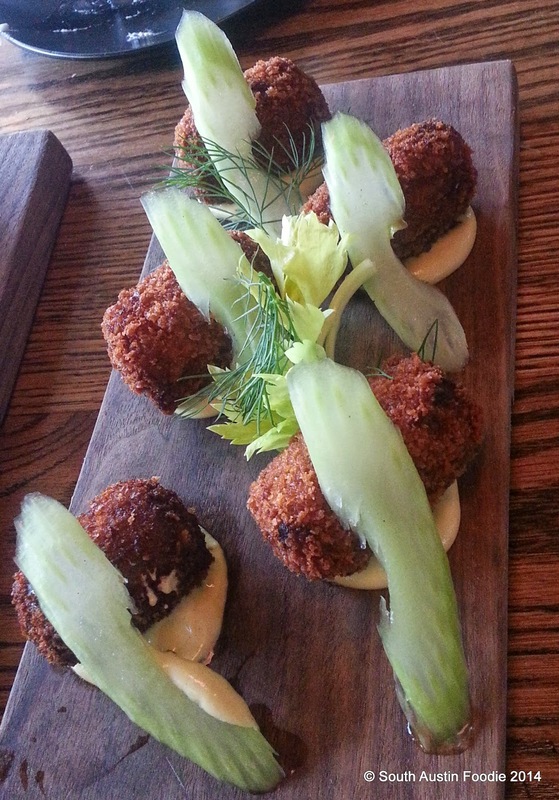 The best dish all around was the oxtail croquettes. They look like well-fried over-sized tater tots, and the shredded beef was super tasty and falling apart. I only ate one of those, but could have easily eaten them all. Dessert....well, there were four of us and four desserts on the menu, so we said, "Sure, why not?!" And we were not disappointed. Now I am not the biggest pumpkin-flavored-anything lover, but this pumpkin cheesecake was pretty tasty (and my companions definitely enjoyed it). 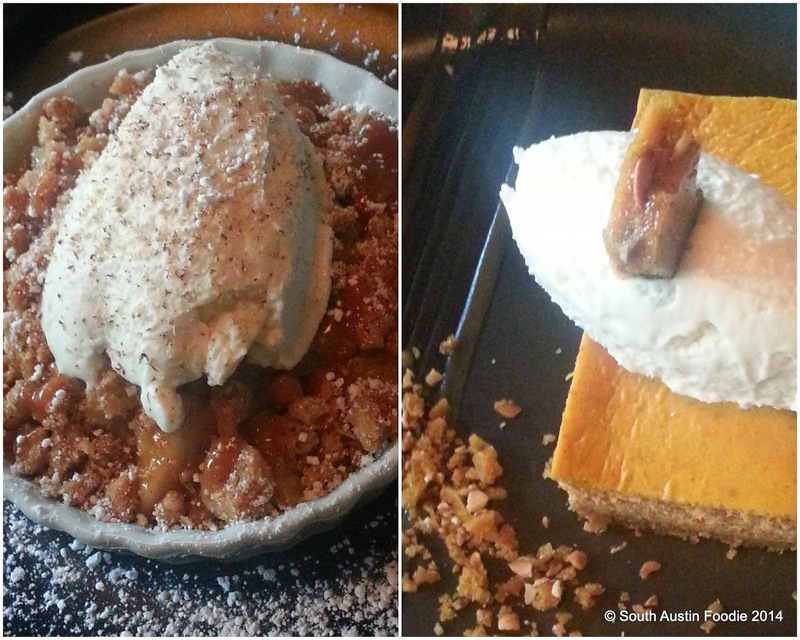 The oatmeal crunch topping on the apple pear crisp was some of the best crunchy topping ever (I mean CRUNCHY! ), and it was graced with an oatmeal stout whipped cream. Not pictured were the donuts (really more like uber-crispy beignets) with salted caramel sauce and some cranberry jam on the side, which were pretty tasty in their own right; and we discovered the cranberry jam was also a nice foil with the cheesecake and apple crisp. 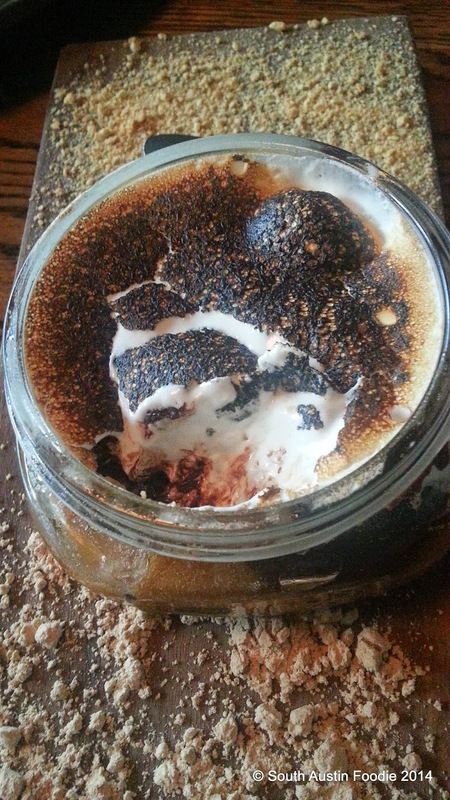 Now the ultimate ending to our happy hour nibbles was the peanut butter and chocolate s'mores dessert, served in a low-profile canning jar. So it's a peanut butter moussey concoction in the jar, topped with chocolate ganache, and marshmallow fluff that's been torched; and that's peanut butter powder on the front of the plate and graham cracker crumbs in the back. I think my exact words after taking my first bite of it were "Oh my flipping god!". Yes, it's that good! The interior is smaller than I thought it would be, as it's pretty much a long, galley-style set up. We were seated in the back booth; not sure if you can get the perspective from this shot. 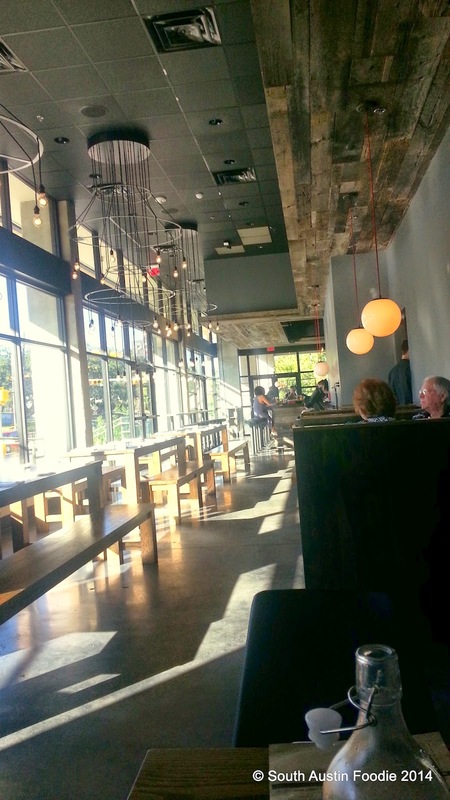 There are three large 10-top tables on the left, a couple booths on the right, and then the bank of booths along the back wall where we were seated. A few more high tables (I think?) by the bar, and some patio seating outside, but I'd guess that total seating capacity is about 100 people total. If I make this picture really large, you may be able to make out the very urban light fixtures on the left; I loved them. Modern, clean lines (as was the whole place), they're different from anything you'd see in a "normal" bar, and I really appreciate that. There are several things on the menu that I'd still like to try, like the beet salad and pierogies; also the French toast and pork belly on the brunch menu. Overall I think the pricing is decent, though $17 for fish and chips does seem high, but I hear they're great. We each paid $26 plus tip, and each had two cocktails and a decent amount to eat. A fun first visit with girlfriends, and I am glad to have Porter in my zip code. Yum! That s'mores dessert looks SO good!